Sweetie Belle giggled with delight as she stared up at her crudely constructed stand. 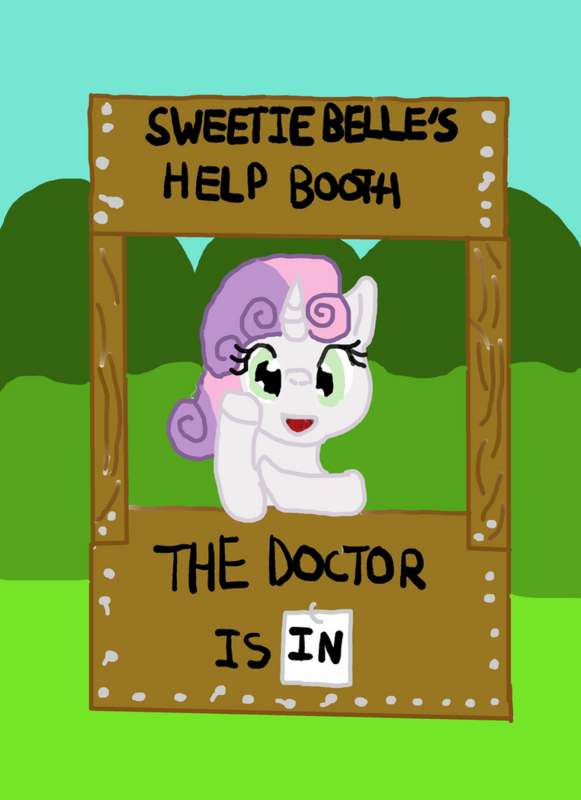 "Sweetie's Help Desk," the sign on top read, and the base of the stand said "the doctor is:" with a little flippy sign next to it that said "IN" on one side and "OUT" on the other. She was soooo excited! The filly danced on her hooves for a moment and twirled around before darting to the backside of her stand, where her saddlebags were stashed. One item at a time, Sweetie began to place her necessities. She had juice boxes and peanut butter crackers hiding on a shelf under the stand, and she had notepads and a cup full of pencils, too! Finally, placed very conspicuously on the desk where everypony could see, was a book she'd borrowed from Twilight. "Basic Psychology." She felt like a real professional psychologist! Psychiatrist? Therapist. "Oh, whatever," she said, shaking her head and looking over her stand one more time. Everything was perfect! Wait, not everything, not yet. Sweetie scrunched her nose and furrowed her brow and concentrated reeeeally hard and magic sparked from her horn and sputtered a little as she levitated a pencil out of the cup and tucked it behind her ear very carefully. She was getting better at this whole unicorn thing! Now she just needed to flip the sign to read "the Doctor is: IN" and she would be set! Oooooh, she really hoped ponies would stop by. She had asked Scootaloo and Apple Bloom to help her put up flyers yesterday, but Scootaloo had gone to do something with Rainbow Dash and Apple Bloom had to help with chores at Sweet Apple Acres, so she'd ended up putting up flyers all by herself. She'd put one at Carousel Boutique and she put one at Sugarcube Corner, and Twilight had even let her put one at the library! Castle? Library castle friendship thing. And she'd put more around other parts of town, too, of course. Finally, brimming with excitement, Sweetie Belle closed her eyes and concentrated again. Her horn sparked with magic and she very carefully flipped the sign over to read "IN." Yaaaaay. This is my first post as Sweetie Belle, so I really hope it's good! Um, basically, this is an advice desk thread. Think, like, Lucy's desk in Peanuts! Ideally other foals would come through to ask for advice, but there's no rule against adults who want to humor the filly. Also, a setup like this it would be a little difficult for Sweetie to interact with multiple ponies at once, so please feel free to "form a line" and interact with other ponies in line! It wasn't long before Sweetie had received her first customer of the day. For it was Java, Equestria's wonderful engineer and scholar, who approached the desk after reading the sign. He had been searching for a psychiatrist after being recommended to do so from his umphteenth visit to the local hospital in canterlot. And just recently, he had found such a thing in Ponyville. And though, he spotted a little filly behind a minute made desk, the pony has a very firm belief that signs tend not to lie. After all, the sign did claim that the doctor was in, right? What could possibly go wrong? The coffee colored pony quickly slid into place after double taking to the sign. And even while his gaze was fixed on the sign, the pony quickly deduced what ever this sign claimed must be true! “Ah! A doctor of pyschiatry! Yes, yes... and a minute clinic at that! Perfect,” The pony then quickly looked down to the filly. His gaze clearly showing that he had not actually taken the time to even question where in the buck, could such a young pony get a PHD. Lore Weaver was on his way back to the Royal Ponyville Library when he spotted an unusual sight. There in the distance was a small stand cobbled together with scraps of wood and nails. Clearly this wasn't like the stalls found in the market area of town, and from the first glance there was a small white pony behind the structure. Maybe it was a foal selling something like lemonade or cookies. Curiosity got the best of him as the purple unicorn approached closer when at his surprise he saw that the filly behind the stands was Sweetie Belle. Lore didn't really know her like he knew other ponies his age as friends, but he did know of her. Why it was hard not to seeing as her and her friends were always zipping from one part of town to the other while talking about some kind of mission and getting their cutie marks. To his other surprise the filly wasn't selling anything but offering psychological help. Well, Lore Weaver had read a few books on the subject, an occupational hazard of being a librarian, but he was nowhere near an expert. Still he wondered what advice he would get from the cute white unicorn, who no doubt saw the world differently than adult ponies did. There was another pony already at the booth and so giving him the needed privacy Lore waited while levitating and reading a book to pass the time. Most confusing fortune... ever. The previous evening, Derpy Hooves snacked on a fortune cookie for dessert, finding the above-mentioned quote when she broke the treat in half. There was one big problem with that fortune however. At the time she finished her meal, Derpy lacked a question lingering in her mind. Therefore, how accurate could a fortune cookie be if one prerequisite wasn’t met? Sweetie belle was almost bursting with excitement when she saw her first custome- er, no, that wasn't right... first PATIENT walk up. She took a few deep breaths as he finished approaching and her face contorted through a range of expectations as she spoke. At first she was bright eyed, hoping to convey that she was all ears, and then she realized that therapists always look so emotionless, so she went with that. A look of shock spread across her face when she realized she hasn't even been taking notes and by the time she started scribbling things down, Java was almost done and she hadn't heard a word he'd said. Panic, she thought, panic NOW. "...I do believe I may be going insane by doing insane acting. I am not even sure what a sane thought is anymore. Is this possible? Shouldn't be... right?" "I think you're really making a mountain out of a mole hill here," she said, trying her hardest to maintain a professional tone of voice (or at least a not squeaky one). "If you're WORRYING that you might not be sane anymore, than you're obviously still capable of lucid enough thought to be considered sane." There. That sounded reasonable. She could TOTALLY do this. Now for the kicker, the one question that would REALLY make her a psycholochiatrist. "So how does that make you feel?" Out of the corner of her eye she saw others join the line. Her first day and she was already successful enough to have a LINE. Maybe she should get a secretary? Oooooh, she wouldn't be surprised one bit if she looked down after this patient left and found out she got her cutie mark! Java's eyes nearly narrowed after hearing the first sentence the mare had uttered out of her mouth. Yeah, sure some may argue perfectly well that any sane pony would be capable of any lucrative thought. But just about any insane pony would be capable of any form of thought, thus such reasoning was nearly invalid. But that wasn't what neccessairly set off the spout of sarcastic remarks that soon flowed from the stallion's jaws. No, it was the final one. How does that make you feel. That same, agonizing question that just about any therapist will ask. How does that make you feel? Well, imagine being told something that you already knew. Or perhaps given the most frustratingly inaccurate bit of words, and told to be happy with the results. The pony leaned in closer, till his chin was nearly touching the counter. Pinchy needed a doctor! Well, that was what she thought when she saw Sweetie Belle's little stand. The filly was in Ruby's class, and she already knew Sweetie was super smart. Maybe she's really getting a jump start on a successful career in psychology! Well, Pinchy was going to be there for the very beginning! When Sweetie Belle was a celebrity therapist, or some kind of 'doctor to the stars', Pinchy would be able to say 'I was one of her first clients!' and totally impress a lot of ponies! Of course, what they wouldn't keep in mind is that her service was free back then! Back then being this present moment, as Pinchy daydreams. But if she's thinking about the present as the past from a futuristic perspective... Then what's really the past? Is it right now? Because right now later on will be the past, but it's not the past right now! It's right now! But is the past right nows still the past? That would make this the future right now! By Celestia! Was her brain teleporting?! She was giving herself a headache... Perfect time to see Sweetie Belle and see if she could help solve Pinchy's cognitive crisis. If not, then Pinchy was sure there were a few other things... more practical things, that Sweetie could help with. Like magic! She remembered reading someplace that some difficulties with magic can stem from some mental issues... But not like the issues her first customer was probably having. Scorpions in the brain won't do much good, they're stuck in there! But anyway, Sweetie is a unicorn! Pinchy is a unicorn! Maybe this common ground could help get Pinchy the answer she needs from the smart pone. Valen had a huge problem. Well, somewhat of a huge problem. Likely a huge problem. Actually not much of a huge problem but one of those problems that hit you so fast and in such a blindsiding manner that you couldn't prepare for the calamity that followed, which was mostly of your own doing! That onl made it worse because if worst came to worst he could pin it on nopony but himself four times over. It had started off with such promise and if this day of his did not improve then it would just be one in a long string of similar incidents involving this small town that did a number on everything from his self-esteem to physical health and social staff, and all for the love of the ponies who resided here! It had started off simply. He had already been on one small fashion tour that had gone well and a huge fashion show in the great Crystal Empire, though a transformation spell given to him by Rarity had some...err, eye opening(among other) effects on him. Best not to dwell on those deep questions for the day, which he had planned on spending in Ponyville simply. See his cousin Applejack for a spell and deliver some Orange materials, pop over to the Boutique to speak with Rarity about some ideas and even see if her smashing hearthrob of a sister was around. But all of that had been derailed even before the rail had finally detoured into Ponyville! He had been recognized not as Valen, but as one of his modeling alter egos and he recognized those who did- paparazzi. He had left the train as quickly as possible and evaded them throughout town. …As the now very light red unicorn 'filly' saw the help desk, all he could do was gulp. There she was, Sweetie Belle. Something about her made Valen a bit warmer and more willing to open up, but not nearly enough to tell the truth. He knew that she was a lover of arts and crafts and he was a living, breathing, arts and crafts project. While he couldn't necessarily allow her to know who he was just yet, he did know that if he asked her to help him- even with a bit of a fib involved- she would so so because she was just that type of pony. And so a light red unicorn filly approached Sweetie Belle's stand as the stallion in front complained about scorpions, Valen sitting down politely as behind him the paparazzi still milled about. They were slowly starting to disperse but for the life of him he had a sneaking suspicion their desire for this scoop would not up and leave. And then another adorable filly arrived- an audience would make this harder for sure, but he was used to a bit of acting for the crowd. Brimming with self-confidence (or was that the cupcakes she'd eaten earlier? ), Sweetie Belle was so busy congratulating herself on a job well done that she barely noticed Java had, in fact, not walked away as a satisfied customer... patient? In fact, she didn't notice until he shouted something about scorpions in his brain, which was the same exact time she noticed that he was way too close to her. She backed up, eyes wide, then coughed a little and calmed herself back down. Professionalism. "There's this wonderful thing called personal space. It's a good idea not to invade it. And if you've got scorpions in your brain, you should really go see a neurosurgeon. I'm not trained to handle brainscorpions after all." Out of the corner of her eye, Sweetie saw a couple more ponies line up. Internally, she giggled with glee and delight and possibly cupcake frosting. "I think that's all the time we have today. I do have more patients after all. Nurse Redheart can probably help you with the scorpions, though! Or maybe Fluttershy. She's really good with critters!" She smiled, waiting for Java to leave. It'd be rude to call the next patient up while he was still standing there after all! Sweetie Belle swallowed nervously as Java trotted away. What an odd pony. Imaginative, though ... scorpions in the brain. Well. Plenty of more patients to go! Sweetie smiled over to Lore Weaver and gave a bright smile as her 'desk' cleared, and was amazed at the line of ponies behind him. Wow! This was going great! She was going to get her cutie mark for sure! "Next, please!" she called to Lore Weaver. Then, after a few moments without him responding, she stuck her tongue out the side of her mouth, and her horn started to glow a soft, pale green. The quill on her stand glowed the same green, and she floated it over between Lore Weaver and his book to break him out of that magic spell that books had over so many ponies. "Can I help you, sir?" she asked brightly. Lore Weaver was so busy reading about the book classification procedures in libraries, not knowing that the pony in front of him had already taken his leave. It was easy for the stallion to get lost in a book, and working in a library didn't help things having hundreds at his disposal. Suddenly a quill caught his attention, floated over to him with a green aura. He looked down to see that it was the filly behind the booth that tried catching his attention, albeit struggling with her magic slightly. "Oh, sorry about that," Lore said as he slipped a bookmark made of a folded paper to mark where he stopped and closed the book, "Guess I got lost in the book." His mind shifted from the book to the question that he wanted to ask in the first place. It didn't take long for it to surface as besides his newfound job it was something that no matter he tried to eliminate remained clear as the day it happened. "Well to tell you what you can help me with I don't think that I can just ask you a question," Lore said as he tried framing it in a way that the filly would understand, "You see something very bad happened to me recently. A monster came to Ponyville, hurt me badly, and destroyed my home and bookstore. Even though I have a new home and a job as a librarian which are great things I can't get those bad memories of the time the monster came to Ponyville out of my mind. So how do you Sweetie Belle deal with really bad things in your life?" Mr. Waddle had a problem. The elderly Earth Pony with the pipe cutie mark was usually the one who gave advice to others, now he was the one in need of wise council. As the glasses-wearing stallion roamed the streets of Ponyville, he spotted Sweetie Belle's wooden Help Desk sign in the distance. "AH! That's exactly what I need! The opinion of a younger filly!" Mr Waddle neighed as he galloped (well, as fast as somepony his age COULD gallop) over to the stand. "Oh Miss!" the elderly pony said respectfully, "I am in need of some advice from a younger pony's perspective. I will gladly wait my turn in line, I hope you can help me." Sweetie turned in surprise as her current patient got interrupted by the newcomer. "Um... of course, Mr. Waddles! I'll be all too glad to help you out, just as soon as it's your turn!" She turned back to Lore Weaver with a smile, trying to think about his problem. How did she deal with such bad things? It sure happened enough, around here. This was a really, really serious question! "Well," she said softly, "I think that everyone deals with that in their own way ... for me, though, when I'm scared, I try to listen to music. Music makes emotions, right? It does thing seven magic can't do. So you listen to music that makes an emotion the opposite of fear! And if you can't listen to music, then make the right music in your head!" She smiled really, really broadly, putting both her hooves on the top of her little desk, and trying to put on the most helpful, professional air she could possibly muster. "I hope that helps you, Sir!" Lore smiled as Sweetie Belle explained how she coped with sad moments by listening to music and how even if she wasn't able to listen to it she could create a tune in her mind to produce good emotions. "I can see that you like music a lot, and I happen to like it too. I guess I do something similar already by getting lost in a good story. Books do produce good emotions too depending on what I'm reading. But I'll definitely try to think of a tune when I'm feeling bad and hopefully I'll be happy again. Thank you for your help." With that Lore dropped a few bits on the desk as a reward for her assistance and trotted away, humming some tune he had in his mind and feeling much better. Sweetie Belle smiled the world's biggest smile at being able to help somepony in need - and with such an important problem! She quickly checked her flank - nope, still blank, though even that couldn't take down her mood just now. Turning back to the line, she smiled happily to see who was next. "Hello, Derpy!" she chirped, then remembered the professionalism. "I mean, Good Morning, Miss Hooves! How can I help you today?" Some of the other pony's questions made Derpy feel a bit silly about hers. Brain scorpions? Bad memories of a monster destroying one's home and livelihood? Yikes. All she wanted to do was solve a weird fortune cookie riddle thing. But it was about her future. That was possibly maybe perhaps conceivably important, right? "Hello, Derpy! I mean, Good Morning, Miss Hooves! How can I help you today?" The slight hesitation was evident in her voice. "Well... I was eating a fortune cookie, right? And the little paper doohickey said 'you already know the questions lingering inside your head." She scratched her head as she recalled the moment. "The problem was, I didn't really have any questions bouncing around in my noggin at the time. What do you think it means?" Sweetie Belle let out a low, awed note. "Wooooowwww... you really don't have any questions? I got questions *all* the *time*! Like, when am I going to get my cutie mark? Or why are all the really interesting books about historical figures supposedly 'not real history books' when it says right on the cover, 'based on the true story of-' Or how come veggie dogs come in packs of 8, while veggie dog buns come in packs of 10? Or what would the world be like if Rarity had become Princess of Ponyville instead of Twilight - would that make me a Princess, too? Or what if Shining Armor was Twilight's younger brother instead of her older brother - would he be a Cutie Mark Crusader? Or why can't woodchucks chuck wood? Or what's the average air-speed velocity of an unladen swallow? Or what IS the ultimate question to the answer of life, the universe, and everything? Or what is the correct fiduciary balance between private sector growth and governmental taxation for an optimum economy? Or why can't I go past a kitten without squeeing over how CUTE it is?!" She paused in her spate of questions, panting softly, her head whirling from all of life's grand mysteries ... What was she saying? Oh yeah! Derpy's question! "But ... you must be exceptionally well-balanced and in tune with your inner self if you don't have any questions in your mind! That's what your fortune would mean, I think. You DO know the questions going through your mind: None! You have no questions! You are happy with who you are and where your life is going, and you have found that inner balance that other ponies keep trying to find. I had no idea you were such a wise pony!" She nodded sagely. "Does that help?" There were certain times in anyones life where you needed help - not just casual 'sticky plaster' help in that it's just...there and gone, but help in the form of advice that sticks and can give some lasting considerations to what might be a troublesome issue - it was often a necessary thing to make the most of, to learn from, and to accept when it was a required part of forward progression towards a personal goal. Oh, the others had all given him the cute jibes and commentary about it all, but Spike couldn't help but think of how it felt so...so unfair that they wouldn't take him seriously whenever it was brought up. Well, no more - this time he was going to go to a pony who seemed to have a grasp on things, who seemed to have an idea as to what was up, and indeed how to achieve that up status...if there was anypony qualified to help him with finding out more on how to make his dreams of getting Raritys attention, it would clearly be Sweetie Belle...who had so conveniently taken it upon herself to have opened up a stall for helping those in situations who found themselves requiring external, semi-quasi-maybe professional filly advice. Afterall, who could POSSIBLY know Rarity better than her sister - it all seemed so obvious now...how could he have completely overlooked it? Spike stepped towards the stall with a determined look on his snout - although, to be honest, a baby dragon such as him couldn't really manage it the way he was intending, but hey...it was worth a try! Derby blinked at the unexpected pile of questions Sweetie Belle provided. And she couldn't help but nod at most of them, as they were, in fact, really good questions. "But ... you must be exceptionally well-balanced and in tune with your inner self if you don't have any questions in your mind! That's what your fortune would mean, I think. You DO know the questions going through your mind: None! You have no questions! You are happy with who you are and where your life is going, and you have found that inner balance that other ponies keep trying to find. I had no idea you were such a wise pony! Does that help?" Derpy? Wise? Well, she was pretty wise, wasn't she? Other ponies don't seem to understand her fashion sense and decorative capabilities. But maybe her skills were just so refined that only another master would recognize her amazing abilities. Yeah, that makes sense. When Derpy snapped out of her thoughts, she realized she was just standing before Sweetie Belle with a wide grin. "Oh yes, that does help! Thanks a lot, Sweetie Belle." Her grin widened. 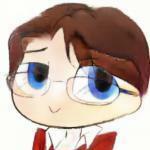 "Feel free to come to me if you ever need some advise too. Since I'm so wise, ehehe"
Sweetie Belle smiled happily, as Derpy proclaimed herself satisfied. "I absolutely will, Miss Hooves! I'm really glad I was able to help!" She gave a happy lil' *wriggle* in her stool, took up her pencil, and made very important notes on the paper in front of her. Muffin, flower, smileyface. There. She shuffled her papers importantly, got a fresh, clean one on top, then lifted up the whole stack of them and tapped them out so they were nice and neat. Just like a professional! Then she smiled brightly to the line, seeing that her friend Valen was next! She gasped and took a moment, pulling out a little compact to pat at her mane. She wasn't sure what she was doing with it, but Rarity always did that before she talked to cute stallions! And Valen was definitely cute. "Hello, Valen" she chirped merrily, "I mean, Mister Orange! What can I do for you?" That was unusual quick and it looked like his disguise worked as intended. After alll, he wasn't hiding Valen from Sweetie, just Gilded from news reporters. Not that it was a great costume, but it seemed to work well enough. What had happened to the others? Mysteries upon mysteries. Maybe Ponyville was so interesting that it stole their attention, like a certain unicorn stole his attention as he trotted up to the front. Sweetie Belle didn't need to fluff herself up any for Valen. She shared a natural and outrageous beauty about her that ran in the same vein as her sister. No doubt when she got older she would have a whole rogues gallery of colts wanting to be as close to her as he was now. Well suckers, Sweetie was with him and there wasn't a single thing any of you silly future colts could do about it, so ha! Valen sauntered up, taken aback by how quickly he felt comfortable here. He took off the little unicorn horn that he had got from the costume shop and approached Sweetie Belle, with a quizzical look on his face. “Why hello there most beautiful maiden, but I heard there was some sort of advice-dispensing filly by the name of Sweetie Belle, and I would so very much like to see her. Tell me, where could she be?” Valen asked, exaggerated worry as he put his two front hooves on the table and winked at Sweetie. She was a sweet filly- her name was well-earned. And it would be fun to spend some time with her today, even if he had come about in a most unusual manner. Sweetie Belle's cheeks pinkened at Valen's outrageous flattery, a tiny little giggle escaping her as she suddenly found herself unable to meet Valen's eyes. "Oh, you," she giggled again. "Yes, well, I'll see if I can summon Miss Belle." She turned behind her. "Miss Belle? There's a Mister Orange here to see you." "Which Orange is that? It's a large family!" "It's a 'Valen' Orange, Miss Belle." "Oh, well, I think I'll have to see him. Let him know I'll be right there." Sweetie turned back to Valen. "Miss Belle will see you shortly." Then she leaned back, pretending to polish her hooves. After a few moments, she straightened up, gave herself a 'professional' expression. "Ah, Valen, so good to see you! Please, come into my office! That's a cute costume you have there - getting ready for Nightmare Night early? Who are you dressing up as? You look kinda like Big Mac. You should have *seen* him the other day at the Sisterhooves Social! You pull it off a lot better than he did, though. So what can I help you with, today?" "This is a stupid idea...this is a stupid idea...this is a STUPID IDEA." Dark mumbled to himself repeatedly as he paced around behind a bush. His pelt and mane, for a rare occasion, free of any dye and his cape left back in his lair. The villain had been having some...issues as of late. And try as he might, he couldn't figure it out. As much as he loathed to admit it, he needed an outsider's perspective. But there was no chance in Tartarus that he was about to go see any professional or other kind of quack. They'd just blabber on about some kind of brain science and say 'How does that make you feel?' or something. And plus, that costs money! No, instead he would opt for the free route! In his daily skulking of the town, the colt had spied a ramshackle 'help desk' set up by a foal he recalled seeing before, Sweetie Belle if he recalled correctly. She had previously had the displeasure of meeting the colt when he was taunting Mudbug and her...and clearly misunderstood his intent! He was evil! Not a jerk. He wouldn't pick on her for being a blank flank of any sort. That's just plain rude. And so the colt had dashed back to his lair and cleaned himself up. Thinking to ask some advice and...ugh...apologize. With a heavy sigh the colt took his place in line behind a little dragon. He had seen the lizard running around doing errands for Princess Sparkle before. What was his name? Spoke? Spite? Barb? Something like that. It didn't really much matter to Dark. HOWEVER, the young dragons little mind reminded him that he was here on behalf of making things between him and Rarity all the sweeter...at least, that's what the little voice inside his head was telling him and disregarding the entire reality that he, quite literally, was not her type. No, such a detail wasn't a thought that Spike Dragon wanted any part of thinking - he was here to see if Sweetie Belle had any worthwhile suggestions, tips and thoughts that might aid in his seemingly non-stop quest to get the attention of the white fashionista's heart! At any rate it seemed like he was going to get some time to think about it - Valen was currently up, and thus the young dragon continues to consider his ultimate suitable queries for the occasion!